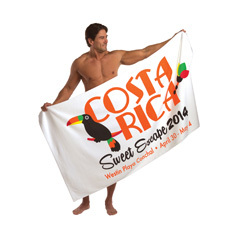 Our promotional weight, velour beach towel offers a soft, velevty finish, large imprint area to showcase your event logo and is still economically priced. It make’s a great giveaway towel! Our mid-weight beach towels are one of our most popular towels. It has a great look and feel with a budget friendly price tag. 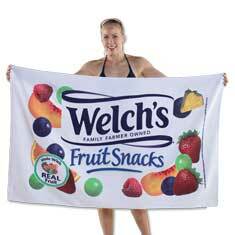 This oversized, lavish beach towel is in high demand for its heavyweight feel at a mid-weight price. Our Deluxe Beach Blanket is our largest and latest edition to our extensive white beach towel collection. 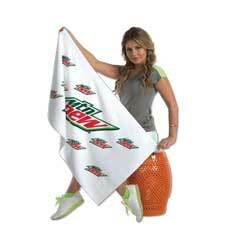 This gigantic towel has ample space for two (or 3) and offers an enormous imprint area - largest in the industry! Superior in every way, these colossal, heavyweight beach towels are sure to impress with their velvety soft surface ready to highlight your monsterous sized imprint.